Instructions from Faroese Handicrafts, translated and rewritten by Christina Westman-Janson. 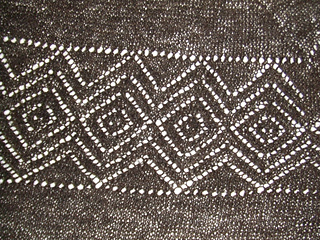 Pattern is shown on page 110. The Swedish edition has mistakes in the lace pattern. Some decreases should slant left, others right, but in the description only k2tog is used. 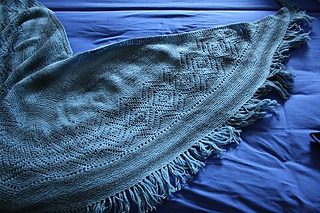 No gauge is given in the pattern (Swedish edition) and no yardage, but it says 300 g of Faroese shawl yarn. I needed about 1100 m including the fringe. Without fringe 900 m were enough. The yardage above is estimated from the English edition of the book based on the recommended 2-ply worsted weight wool yarn (1000 ypp) of 400 g / 14 oz. 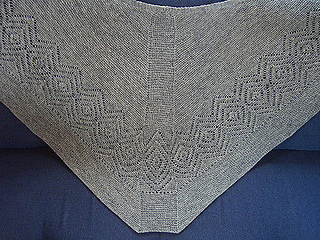 Pattern has also been translated into English from the Faroese by Marilyn van Keppell and appears in the accompanying booklet to Føroysk Bindingarmynstur / Faroese Knitting Patterns as ‘Johanna Maria’. That pattern calls for “260 gms fine 2-ply natural sheep colored yarn and 240 gms fine 2-ply white yarn for the lining”.